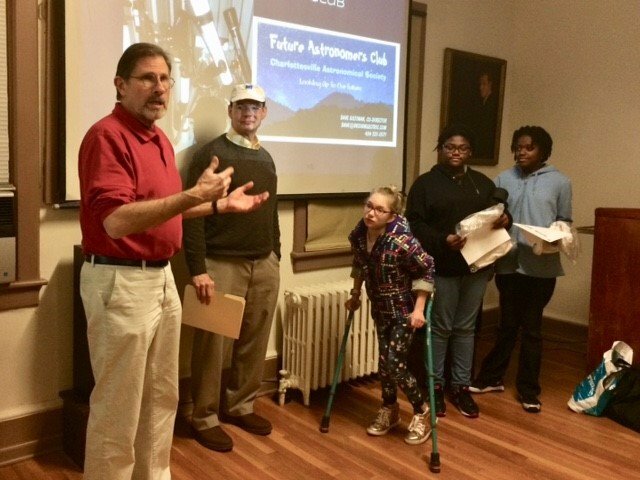 The Charlottesville Astronomical Society has gently used and refurbished telescopes available for junior astronomers in the 4th through 12th grades. These telescopes kits are portable and will allow the user to view and study the moon, planets and many deep sky objects. The kits will be made available FREE of charge, one per family, to interested families who complete a three 90 minute instruction sessions led by members of the Charlottesville Astronomical Society. The sessions will be held at the McCormick Observatory on the grounds of the University of Virginia. To be considered for one of our Future Astronomers Program telescopes, please complete this form and mail it to: Steve Layman, 1633 Regent St, Charlottesville, VA 22911. For more information, please email Steve Layman.